How, over the past two decades, did the image of the tobacco industry change - in the words of one of the interviewees in “Addiction Incorporated’’ - from Kellogg’s to the Gambino crime family? This eminently watchable documentary traces the work of scientists, whistle-blowers, news reporters, lawyers, and ultimately Congress to expose what they say was decades of deceit by Big Tobacco in making and marketing products it long knew to be highly addictive. In a film rich with engaging talking heads, the star witness is easily scientist and whistle-blower Victor J. DeNoble, who serves as the stand-in for the unsuspecting populace duped by tobacco companies. Hired by Philip Morris in 1980 to develop a safer cigarette, DeNoble thought he was working for the public good. But when he discovered his lab rats were soon self-administering their nicotine fix at an alarming rate, he documented his findings in a 1983 scientific paper and informed Philip Morris that a combination of chemicals in the cigarettes made the product highly addictive and thus a “safe cigarette’’ was impossible. The company, in one of many ironies, took this as good news and squashed DeNoble’s sophisticated research about the danger of its “good old-fashioned American product.’’ DeNoble became a whistle-blower, but one with folksy charm and quiet conviction that led to his testimony before Congress in 1994. Director Charles Evans Jr. wisely relies on DeNoble to guide the viewer through the complex timeline as Big Tobacco topples from an unregulated industry as recently as the mid-1990s to one considered “radioactive’’ for its allegedly purposeful pushing of a dangerous drug. 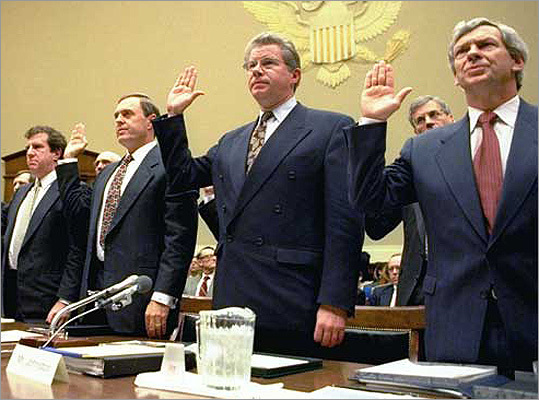 The best parts of the documentary are the straightforward, hard-hitting interviews and footage of the landmark mid-’90s hearings before the Subcommittee on Health and the Environment when, under tough questioning by Representative Henry Waxman (D-Calif.), all seven Big Tobacco CEOs stated under oath that cigarettes are not addictive. “Addiction Incorporated’’ sometimes doesn’t trust the power of its hard-hitting interviews and, especially at the beginning, resorts to gimmicks such as tongue-in-cheek animation of rats under the influence of nicotine. Once it finds its footing in old-fashioned journalism, the film packs a wallop. Even if many of these facts are already known, the cast of characters Evans has assembled - heroes, villains, and many in between - bring the story of rapid scientific, political, and social change to new, unforgettable light. Loren King may be contacted at loren.king@comcast.net.